Cleaning your mattress regularly is crucial to getting a good night’s sleep, but it’s not something many people think about. Mattresses can be home to thousands of dust mites, which feed on dead skin cells and love to hang out in your mattress. By steam cleaning your mattress, you get rid of these mites and ensure your mattress is fresh. If you have any allergies to dust, dander, or even your beloved family pet, steam cleaning your mattress will allow you to sleep comfortably. Steam cleaning can also help get rid of pesky stains on your mattress, as well as any lingering odors. Before you get to work steam cleaning your mattress, check the label to see if it’s okay to use a steam cleaner on your specific mattress. Some mattresses tolerate steam cleaning well, but others don’t. Next, vacuum your mattress to get any dust, hair, or dirt off the mattress, as your steam cleaner can’t remove these. If you don’t already have a steam cleaner, you’ll have to purchase one. They’re relatively inexpensive and can be used for all kinds of cleaning jobs around the house, from cleaning floors to curtains. For steam cleaning a mattress, look for one that has an attachment that you can easily maneuver over the mattress. When it comes to actually steam cleaning your mattress, you shouldn’t have to do too much work. Fill your steam cleaner with water according to the instructions. 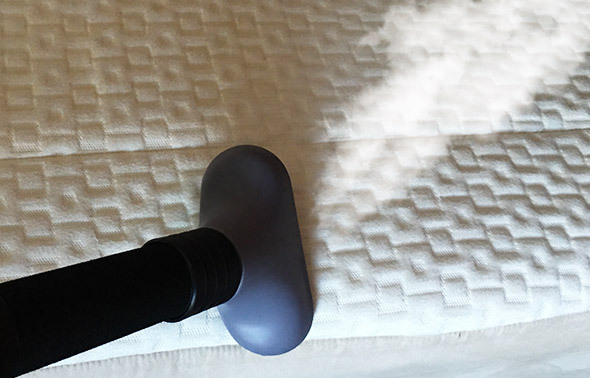 Wait for the steam cleaner to heat up, then simply use the attachment on your mattress. Make sure you go slowly, hitting every part of the mattress with the steam cleaner. You’ll notice stains disappearing before your eyes as you go. 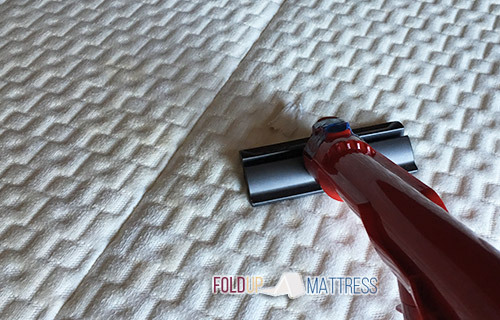 Steam cleaning the whole mattress shouldn’t take you more than about 15 minutes. Once you’ve gone over the whole mattress, your mattress will be completely sanitized. However, it may still be damp. Some steam cleaners dry as they go, making the process faster. Depending on the thickness and material of your mattress, you may have to wait anywhere from 2 to 6 hours for your mattress to dry out completely. Make sure the mattress is in a well-ventilated area to cut down on drying time. Use this time to throw your sheets and blankets in the washing machine, too. Check that your mattress is totally dry before putting your sheets back on, and you can sleep in your mattress the same night you cleaned it. Steam cleaning is a very quick and surprisingly effective way to completely clean and sanitize a mattress. For someone with allergies, consider steam cleaning once a month as part of your cleaning routine. This will keep allergens from building up on the mattress. For most people, a good steam cleaning every couple of months should be enough to keep dust mites and bed bugs away and keep your mattress looking and smelling fresh. Taking care of your mattress will help it to last longer and provide you with many nights of comfortable sleep.